I'd like to end this year with a sincere plug for the 2010 sponsors of DLK COLLECTION. Given that the vast majority of our readers subscribe to the feed (rather than arriving directly to the site), many of you may not even realize that we have sponsors. In fact we do, and their banners fly proudly along the sidebar. As a friendly reminder, although we don't have non-profit status, being a photography critic/blogger is undeniably a money losing proposition. It's also a massive time sink, and if it wasn't such an amazingly gratifying and challenging labor of love, a rational person would give it up right away. Our sponsors provide something extremely valuable that our mostly silent readers, followers, and intermittent anonymous visitors don't: they provide a public vote of confidence for what we are doing. With their dollars and their brands, they support the grand idea of a multitude of hopefully intelligent voices engaging in thoughtful discussion about photography of all kinds. But let's not be confused however. While counting the number of click throughs or page views of a banner is mildly entertaining, the point of sponsoring this site is to get bodies in the door, to add subscribers (for the magazines), and to generate tangible sales. If we can reliably connect the dots between reading reviews on this site and buying photographs in the real world, then we're doing much more than just shouting into the void. While each and every one of our 2010 sponsors is deserving of my heartfelt thanks and your disposable income, I would particularly like to highlight the support of Janet Borden Inc. (here). Janet's gallery has been an anchor sponsor of this site for the entire year, taking the top banner slot month after month. She has been tirelessly enthusiastic about the evolution of this blog, and has been quick to point out my delusions and misguided opinions with her biting wit. Her persistent encouragement, even when her show of the moment didn't get 3 STARS, has been invaluable. If you find enjoyment in what we are doing here, I urge you to reward Janet for giving her support when it wasn't even remotely obvious. Get down to Soho and buy that Lee Friedlander, Tina Barney, Martin Parr (or whoever) that you have been coveting, and tell Janet that one of the reasons you are there with your dollars out is that you read DLK COLLECTION. You can thank me by thanking her. Finally, I'd like to send out an authentic thank you to the many sponsors (past, present and future) of other photography blogs. This is a vibrant and collegial community and the dollars that are spent in support of Joerg Colberg or AD Coleman, Marc Feustel or Andy Adams, or countless other important voices are critical to keeping them on the air. I know from experience: don't underestimate what a small amount of support will do for the confidence of a writer wondering if they can feed the beast with something intelligent for yet another day. And by the way, their daily traffic of targeted, photography-loving visitors is likely larger than the entire client database of most galleries. This is the last post of 2010. We'll be back in January, starting with the posts that didn't get done this week: the 2010 Auction Summary, the Top 10 Photobooks of 2010, and hopefully some reviews of books that came out from under the tree. Happy Holidays! In the past year, I have reviewed photography shows at a total of 77 different venues in New York and the surrounding area. After sifting through the best shows of the year in yesterday's post (here), I wondered about whether there might be some intriguing patterns if I looked more closely at the venues that were organizing those shows. I've divided the venues into four groups: Specialist Photography Galleries, Contemporary Art Galleries (who show photography from time to time), Specialist Photography Museums and more general Art Museums (who also show photography from time to time). Of course we can quibble about which group a particular gallery belongs in, but I've done my best to locate them where I think they actually belong. I've then made two simple sets of calculations: a raw tally of the total number of shows I reviewed at each venue, and subsequently, the average rating I gave those specific shows. In reviewing these statistics, keep in mind a couple of things: 1.) 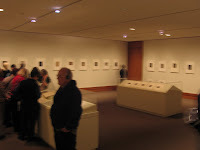 many of these places have multiple gallery spaces, and often run two or more exhibits simultaneously that I might review as separate and distinct shows, so while a normal gallery calendar might have 6-8 shows in a year, some of these locations have twice that many shows on view across the same period of time, and 2.) our rating scale has a high of 3 STARS and a low of 1 STAR, with shows below that receiving no review/rating; therefore the highest possible average is 3.00, and the lowest is 1.00 - although this low number is misleading, as one could imagine tallying all the shows I didn't review and giving them zeros and then adding them into that average, which would bring the numbers down substantially for many venues. Rather than descend into that kind of negativism ("all the photography shows at Gallery X or Museum Y were crap! "), I suggest we focus on the positive and just take the statistics with a grain of salt. I think these numbers are mostly indicative of depth, both in the sophistication of their exhibition programs and the breadth of their stables or curatorial interests. They tally consistent commitment and performance in the staging of solid photography shows, and over time, create a sense of brand, in terms of places that visitors can expect to see quality photography over and over again. I think a score of 4 or higher here is something to be proud of. 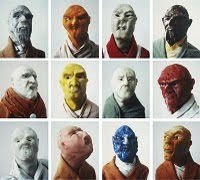 Congratulations to Yancey Richardson Gallery for putting up the biggest numbers. In my view, an average of over 1.00 for the Photography Specialist galleries is an achievement worth noting (they're putting on photography shows every month remember), and for all other venues, an average of over 1.50 signals something special. It is no surprise to me that the MoMA and Met have such solid ratings numbers, nor that Marian Goodman, Pace, and Matthew Marks came out so high this year. Congratulations to Marian Goodman Gallery for having the highest ratings for photography of any local venue this year. I think these numbers expose an obvious reality in the gallery world: in many cases, top photographers "graduate" from a Photography Specialist gallery to a Contemporary Art gallery when they achieve a certain level of stature. This isn't always true, but the fact that many of the Contemporary Art galleries have such impressive ratings numbers is indicative of cherry picking of the "best" photographers and showing their work from time to time - their overall photography programs are not as consistent, but when they do show photography, the quality tends to be high. A final consideration for these lists is who's conspicuously missing. I went back to my list from 2009 and discovered a large number of well known venues (38) who either failed to attract my attention enough for a review of anything on view this year or were somehow absent from the photography scene entirely. Without naming names or casting aspersions, I very much hope to see a return of superlative photography to these locations in 2011. As 2010 draws to a close, the time has come to single out those gallery and museum shows of photography that were the best of the year. In many ways, such a choosing and list making has a delicate element of photographic re-evaluation - what looked good then is perhaps less amazing now and vice versa. With the benefit of 20/20 hindsight, we can now see the past year's photography shows not as discrete individual units rated on their own merits in a certain place and time, but as passing moments placed on a larger scale of relative worth, part of the entire continuum of art history. Which of these shows (or artists) will matter in ten or fifty years, and which others will have faded into obscurity before we ring in the New Year? After a total of 153 in-depth photography reviews this year (and countless others visited and tactfully omitted), I certainly have some opinions on these questions. While I had plenty of moments of awe and enchantment this year, I have to admit that as the months clicked by, I more often struggled not with too much joy, but with the concept of grade inflation: not wanting to give an endless stream of 1 STAR ratings (which some of you have complained about), and yet, not really finding enough shows that met my internal idea of something astonishing. Where were all the mind-blowing shows I was searching for? At year's end, a total of 10 shows (a paltry 6.54% of all shows reviewed) had received our highest 3 STARS rating, given to the single best photography show on view in any given month in our restricted time-based rating scheme. Logically, this kind of system should have produced twelve 3 STARS shows (1 for each of the 12 months), but this year, somehow it didn't. Similarly, a total of 31 shows got a 2 STARS rating (20.26% of all shows reviewed). And again, the system should have produced 36 of this 2 STARS rating type (given to the next three best shows in any given month, times 12 months), but it didn't. Was I just annoyingly stingy and overly critical, or was there really a slight decline of quality and originality? As I review these two lists, now with the advantage of passing time and the resonance of memory, I am generally happy to defend how these ratings ended up; I feel like this Top 40 (41 actually) was largely the best of what was on view in New York this year - if you only saw the 3 STARS shows and nothing else, and even though these shows had their own flaws, on the whole, you would have had a pretty solid year of photography viewing. If pressed to do some fudging along the edges with the long arm of history watching, I think Joe Deal (@Robert Mann), David Goldblatt (@Jewish Museum), or Leon Levinstein (@Met) may end up being more important than I originally gave them credit for. But on the whole, I stand behind the ratings and the logic/rationale the supports each of them. 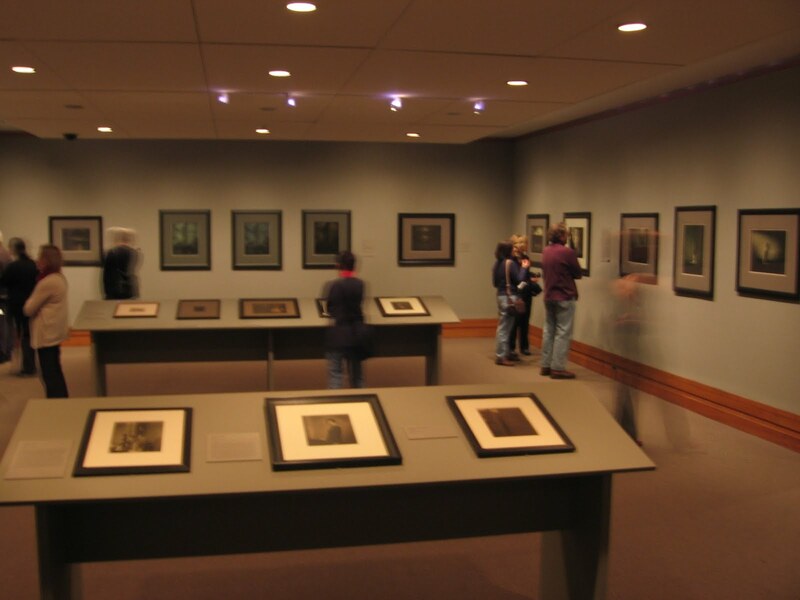 The harder question to answer is whether my conclusion that 2010 was a less than stellar year for photography was actually a commonly held perception among gallery patrons, museum goers or collectors. Perhaps this community of readers saw the world differently, and the breath taking high points you experienced were more consistent than mine. I think great shows take us outside ourselves, providing excitement and inspiration, challenging our accepted ways of thinking, and hopefully educating us in broad and unexpected ways. I think many of us that haunt galleries and museums are relentless seekers, looking for those stimulating ideas that jolt us into new and unexpected mindsets. 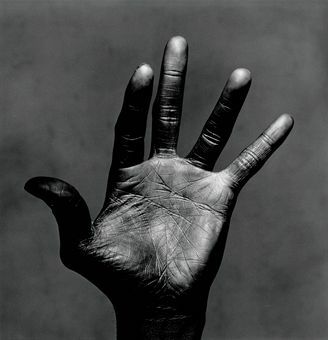 But unfortunately, regardless of whether the work was vintage or contemporary, black and white or color, I just don't think that there was enough of the ground-breaking, durably original, idea-rich, radical boldness on view in 2010 that would normally keep my mind buzzing for days. This apparent minimum of greatness does not however dampen my overflowing enthusiasm for photography in all its myriad and ever-changing forms. Perhaps we are in a short-term, temporary lull, waiting for the gathering of now-unformed ideas into authentically new visual vocabularies. Hopefully 2011 will bring all those mythical shows to New York that I have been impatiently waiting for, the work having been caught in the backwaters of scheduling and slot filling. Against the backdrop of nearly two centuries of photographic history, I'm sorry to report that 2010 didn't show us as much as I had hoped for, but my standards and aspirations for the medium are perhaps unrealistically high. But with the New Year comes a clean blank slate, and the opportunity to be surprised and amazed all over again. 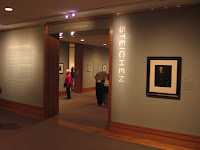 Comments/Context: The Stieglitz, Steichen, Strand show at the Met is exactly what its title suggests: three silos of star-power vintage work by contemporaneous master photographers, the connecting backstory provided by snippets of explanatory wall text. Given the Met's truly world class holdings in the work of these three influential artists, the show is a budget-friendly way for the museum to bring some of its treasures out of storage. 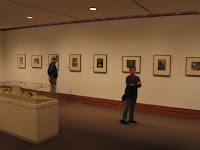 The Stieglitz room is basically a mini-retrospective, with representative images from most of his major themes and subjects: late 1800s Pictorialist New York, Modernist nudes of Georgia O'Keeffe, cloud study Equivalents, views near Lake George, and later 1930s New York cityscapes. It's a solid, greatest hits summary of Stieglitz' career, with everything from Spring Showers and The Steerage to Spiritual America. While this room is densely packed with famous imagery, Stieglitz' nudes of O'Keeffe never fail to outshine everything else for me. There is a full wall of elegant fragmented body parts on display, pared down and thrillingly alive; few have done it better in the century since. The Steichen room focuses on his turn of the century Pictorialist work, leaving out virtually all of his later career. Clustered at one end of the room are some of the gems of this era: moonlit landscapes, ethereal nudes, and haunting images of Rodin's Balzac. But shockingly, even these masterpieces fade into the background when hung near the set of three large exhibition prints of the Flatiron Building. Seen alternately in soft green, rich blue, and dark brown, the building's personality changes, looming out of the twilight. Together, they are a staggering example of tour-de-force printing. The Strand room centers on the first two decades of the photographer's career, and it is Strand's images from before 1920 that are the most relevant to the discussion of the interactions with Stieglitz and Steichen. His sparse, geometric abstractions from 1915-1917 really broke with the past and ushered in Modernism. The black rectangles of Wall Street, the arcs of bowls, the patterned shadows on a table, even laundry strung across city backyards are all transformed into pure lines and shapes, breaking with the fussiness of Pictorialism and leading the move to straight photography. With such an embarrassment of riches on display, it seems downright ridiculous to find fault with this show, and yet, I think it suffers from trying to do too many things, and ultimately fails to tell us anything particularly new about these three photographers. If the goal was to parse the intricate connections between these three (both artistically and as people), then a chronological ordering and timeline would have been much more effective in teasing out the influences; the current structure creates three distinct buckets, and the connections and overlaps between them aren't made particularly clear (the supporting exhibit of 1910s photography doesn't add much to the narrative either). 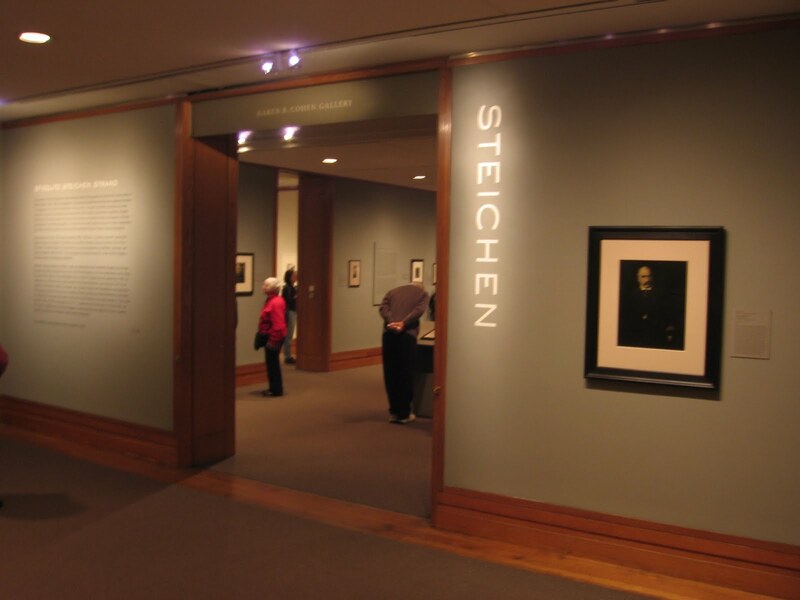 And while the Stieglitz room has a retrospective feel, the other two are edited in ways that add more random and tangential elements into the conversation (Steichen's autochromes, Strand's Mexican portfolio). There is also an overlay of process instruction, begun on an exterior wall, but left unfinished and uncorrelated in the three gallery spaces. In the end though, these quibbles are drowned out by the power of some of the iconic prints on view. While the scholarship ball may not have been moved forward much with this show, what I'll remember about this exhibit five or ten years from now is getting the rare opportunity to stand up close to those three Steichen Flatirons, and to see for myself just how spectacular they truly are. Collector's POV: I'm going to forgo the usual discussion of prices for this show, not only because this is a museum exhibition, but because trying to accurately pin down prices for the rarities on display here is simply a fool's exercise. While the work of all three photographers is generally available in the secondary markets, if we focus on the "best of the best" prints (especially the large exhibition prints), there are few if any market equivalents. Undeniably, if some of these masterworks were to inexplicably come into the market now, they would easily fetch well into the millions. This isn't true for everything on display, but this exhibit has a stronger concentration of exceptionally valuable/expensive vintage photography than any other show in New York this year. According to our statistics on 71 different auctions around the world in 2010 (covering both focused Photography sales and the photography buried in Contemporary Art and other compilation sales), these were the top 10 photography lots in terms of overall selling price this year. Unlike last year, when no works crossed the $1 million dollar mark in public secondary market transactions, 8 out of the top 10 lots this year broke that threshold (3 actually crossed $2 million dollars). Our top lot last year (Gilbert & George, The Moon, 1978), would have been good for a tie for 10th place this year (last year's list can be found here). 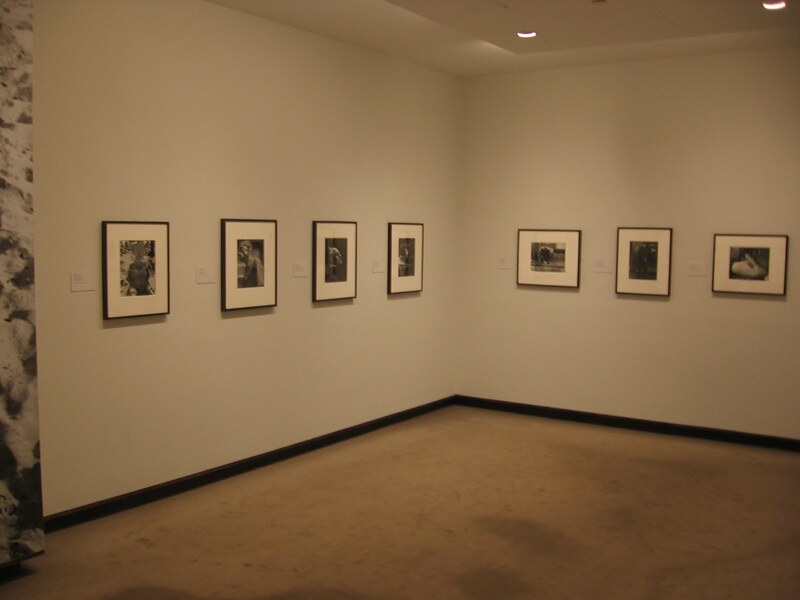 While some might persuasively argue that certain artists do not fall under the label of "photography", all of the works that have been included in this list are made up of photographic prints. Prices all include the buyer's premium and have been converted to dollars/rounded to the nearest dollar where appropriate (1 Euro = 1.31 Dollars; 1 Pound = 1.55 Dollars, both exchange rates slightly lower than last year; varying quality reproductions via the respective houses). While we cover most of the major auctions, it is entirely possible (though not hugely likely) that a photograph could have sold outside our coverage area, in a smaller house or in a secondary market location (especially in the 19th century realm), but could still have reached the top 10 in terms of overall price. So please, if we've missed something somewhere, by all means, add it in the comments. 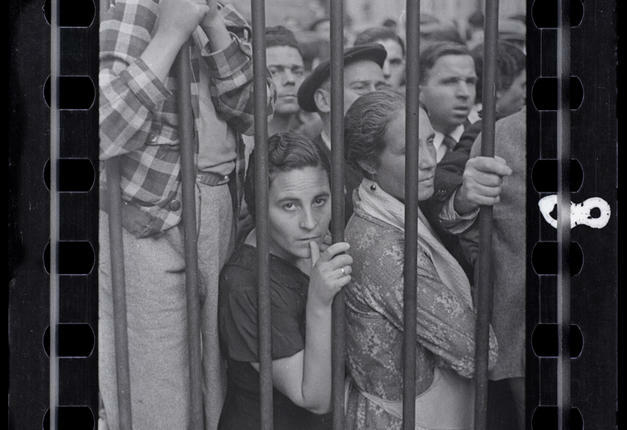 The exhibit begins with a "before" section, a series of images of life in Havana under Batista, before the revolution: drunken tourists, chorus girls, hotel gambling and brassy nightlife, juxtaposed with tenements, prostitutes and student demonstrations, with an underlying premonition that these inequalities could not be sustained. The story really starts to accelerate with images of people murdered in the street, cars blasted with gunshots, and Castro being released from prison; the clear conclusion from the pictures is that feelings of unrest were building. As the fighting starts in earnest, the images become almost like classic guerilla propaganda: scraggly beards, camouflage fatigues, rebel outposts in the jungle, military leaders on patrol and giving fiery speeches. 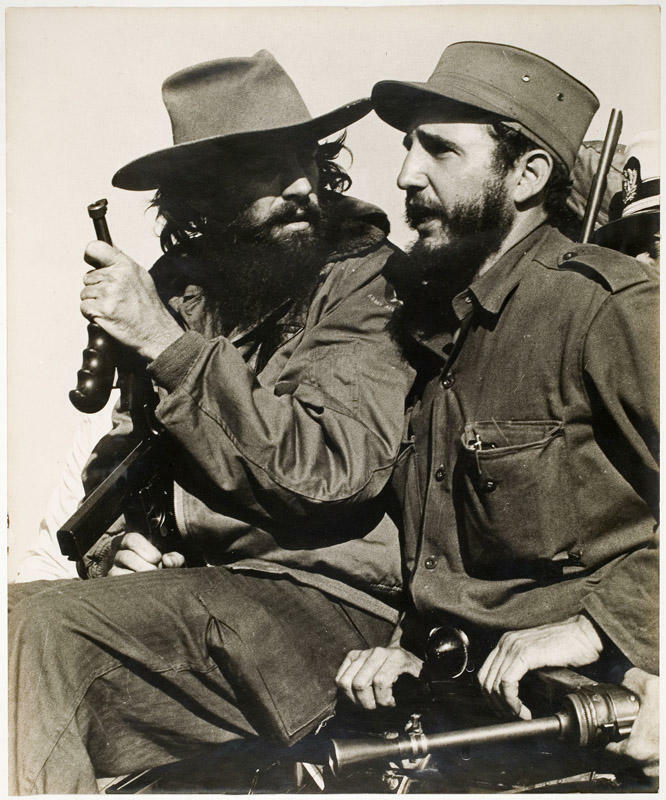 I say almost because these were independent photojournalists not media stooges, and yet, it's fascinating to see how the revolutionary leaders crafted scenes, situations and photo ops that offered certain visual conclusions, how they controlled the message and generated fervent drama. After the jubilant tanks roll in and the government falls, the tenor of the images changes once again, now showing Castro at the UN, Castro jumping down from a tank during the Bay of Pigs invasion, or on skis in the USSR, consolidating his diplomatic position on the world stage, less guerrilla and more emerging statesman. 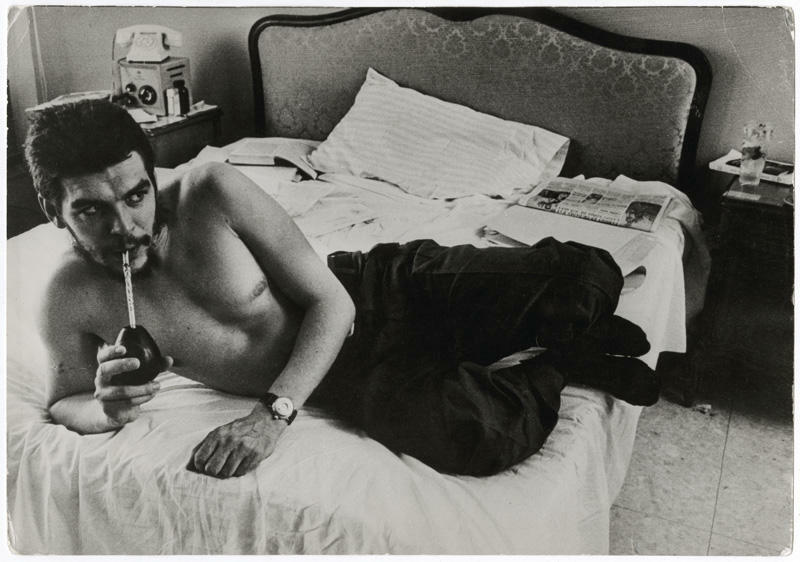 The better part of two entire rooms is devoted to heroic portraits of Castro, Che Guevara and other rebel leaders, and these images show these figures at their most photogenic - alternately brooding and defiant, warmly human or even solemn and almost religious. 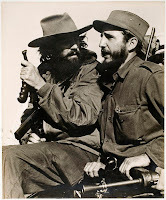 Che smokes and drinks mate, Castro plays baseball and golf, and pals around with Hemingway. Alberto Korda's famous portrait of Che is shown in a variety of sizes and croppings, showing how the intensity of the image was maximized. Around the corner are a series of later images of Che's death in Bolivia, where his corpse is laid out, reverently and theatrically photographed like an iconic Jesus. 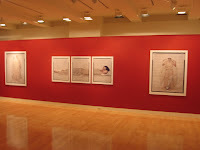 The final two sections of the show show contrasting views of the Cuban people and their feelings about the revolution. 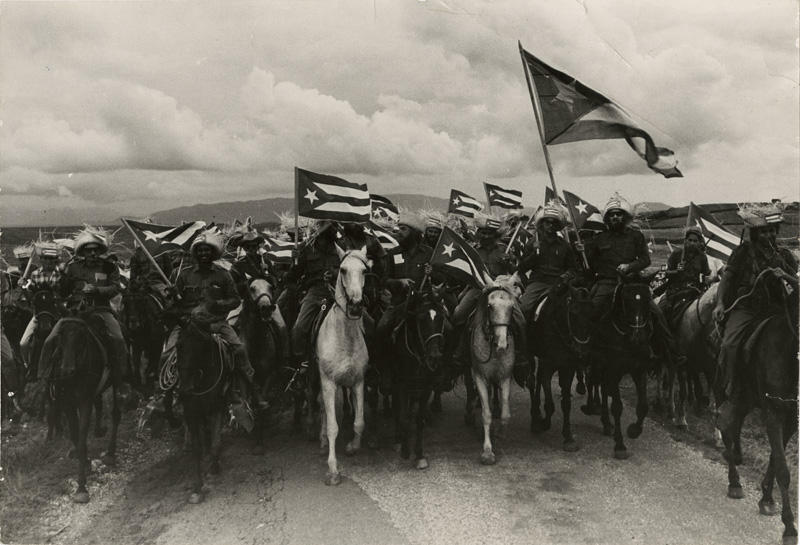 One section shows celebrations and mass rallies in support of the rebels, with flags and hats perched on machetes, the ideals of the revolution embodied in pictures. The images from the mid 1960s show families in exile (or on the way), dancing and kissing, and kids showing off a banned Beatles album. Here we have the origins of resistance and counterculture, and the divisions couldn't be more stark or obvious. 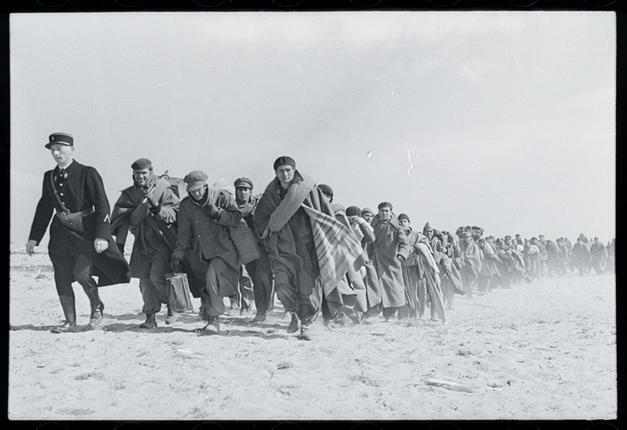 Regardless of your opinions or biases on the politics of the situation, this show is a perceptive look at the creation and shaping of collective history via photography. These are powerful, well made pictures with the ability to exert influence over the simplistic categorization of "good" and "bad", and they re-opened my eyes to the complex and nuanced nature of photojournalistic storytelling and narrative building. 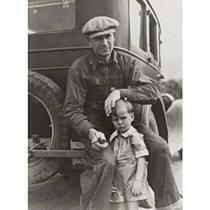 The results of Christie's final various owner Photographs sale of the year generally met expectations, falling right in the heart of the estimate range. 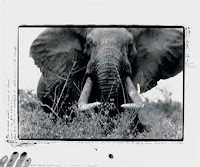 Even though the two Penn lots that topped the sale failed to sell, a handful of prints by Peter Beard picked up the slack. The overall Buy-In rate came in just over 25%, ensuring a solid if uneventful outing. 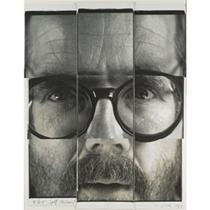 The top lot by High estimate was tied between two lots: lot 65, Irving Penn, Cuzco Children, Neg. 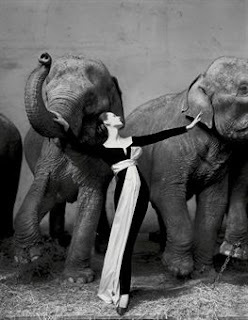 No 142, Peru, Dec 1948, 1949, and lot 137, Irving Penn, Juliet Auchincloss, 1949, both at $30000-50000; neither of these lots sold. The top outcome of the sale was lot 160, Carrie Mae Weems, Untitled #2450, from Kitchen Table Series, 1990, at $35000 (image at right, top, via Christie's). ADMINISTRATIVE NOTE: Thankfully, this is the last of the auction results posts for the year. After a pair of remaining show reviews at the beginning of next week, we'll head into our massive year end roundups. These will include the 2010 auction summary and top 10 lots at auction in 2010, the top 10 gallery and museum shows of 2010, the top 10 photobooks of 2010 and a sincere plug for our 2010 sponsors. Get ready! There just isn't any way to sugar coat the dismal photography results from the recent MUSIC themed sale at Phillips in London. With a Buy-In rate at 60% and Total Sale Proceeds that missed the estimate range by a mile, it was a bomb. Luckily, the top two lots found buyers, avoiding what would have been a major wipeout. 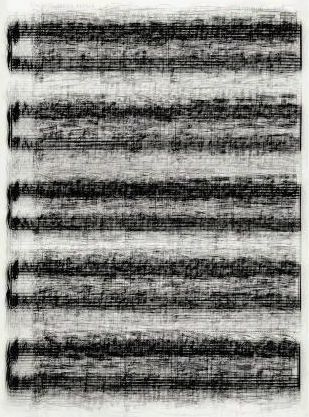 The top lot by High estimate was lot 1, Idris Khan, Rachmaninoff...Preludes, 2007, at £35000-40000; it was also the top outcome of the sale at £56450. Comments/Context: John Baldessari's fantastic retrospective exhibition now on view at the Met has more ideas per square foot than any other show I have seen in New York this year. It voraciously wanders from idea to idea, mixing and juxtaposing, compiling and clustering, with a powerful cerebral logic that moves easily from arid and brainy to joyfully playful and downright funny. 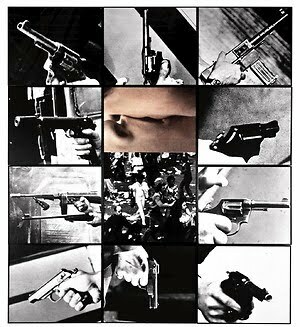 While Baldessari has aptly been called the godfather of Conceptual art, this show led me to a more complex reading of where his greatest innovation really lies. I now see him at the confluence of three rivers of artistic thought: the last waves of Pop art and its transformation by mass culture, the heady idiosyncrasy of Conceptual art (especially in its manifestations in photography and its explorations of optics, illusions, and visual puns), and the birth of Appropriation art and its reuse and recontextualization of images drawn from various media, including the cinema. These three sets of forces have been processed in his mind, twisted and connected into a range of new and original possibilities and end points. He is really much more of a bridge figure and downstream influencer than I gave him credit for. The exhibit is organized chronologically, so the first several rooms are full of mostly 1960s-era paintings that expand beyond the realm of Pop and introduce the combination of smart textual language and photographic imagery to stretched canvas. You can really see Baldessari moving beyond simple representations of everyday pop culture objects toward a more inward looking examination of the nature and process of art itself. Out of the ashes of his cremation of most of his early work (complete with urn and cemetery plaque) comes a flowering of conceptual projects the depth and breadth of which is truly astonishing. When Baldessari transitions to the larger scale multi-part photocompositions for which is likely best known, I think the air actually deflates just a bit; in comparison to the sly trickery and raw energy of the 1970s work, from the 1980s onward, I think the power of the works is more muted. He's moved on to appropriation as his main underlying tool (particularly from film stills), and has relied on implied emotion, psychology, and symbolism as his primary tricks of the trade; each gathering of juxtaposed images (enlarged, cropped etc.) is now a kind of dramatic rebus to be puzzled out. A ladder of dead and sleeping men lay in horizontal stripes, guns radiate from a kiss, gangsters and lovers are paired together, people fall upward, and a long thin line connects a mountain climber and a scuba diver who are juxtaposed with cakes. Soon his signature colored dots are introduced to make faces anonymous, and this motif then evolves into colored silhouettes and overlapping painted/photographic scenes. The clusters get physically larger and larger as the years pass, becoming both more intricate and more obtuse. The final room of the show contains his most recent works and has him coming almost full circle, back to pared down painting once again, but via the assimilation of decades of underlying conceptual themes. For seekers of brain stimulation and lovers of open ended interpretation, this retrospective is a must see. In many ways, what I like best about this show is that photography is seen as an integral part of the evolution of Contemporary Art (capitalized), where multiple images, automatic picture making, serial and time-based works, and the rethinking of photographic imagery are all tightly woven into the fabric of ideas that are being explored, rejected, and reimagined. It is no wonder that Baldessari has been so influential; his abundant harvest of witty logic has not only collated several of the main tributaries of recent artistic method, but has provided handy jumping off points for countless others who have explored some of the more promising side roads and backstreets. Rating: *** (three stars) EXCELLENT (rating system described here). With an overall Buy-In rate over 60%, the results from the two recent photography sales at Van Ham in Cologne were, not surprisingly, far below the pre-sale estimates. 4 out of 5 of the top lots failed to find buyers, and there just weren't enough positive surprises to make up for all the passed lots. (Van Ham does not provide an estimate range in many cases, just a single estimate number, so this figure is used as the High estimate in our calculations). 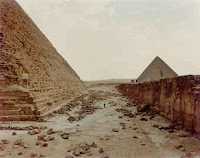 The top lot by High estimate was lot 1046A, Andreas Gursky, Cairo (General View), 1992, at 35000-45000€; it did not sell. 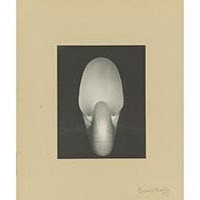 The top outcome of the sale was lot 1415, Edward Steichen, An Apple, a Boulder, a Mountain, 1921, at 48300€. Comments/Context: I'm guessing that most contemporary photography collectors can easily identify the work of Lalla Essaydi: large scale color images of young Arab women, draped in gauzy white clothing and covered head to toe with Islamic calligraphy, with the patterns of writing echoed on the walls and furnishings around the subjects, creating an enveloping environment of patterned henna lines. 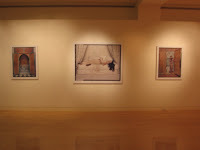 Her works explore and reimagine Western stereotypes of the Arab world, from exoticism to 19th century Orientalism (think Delacroix), adding a uniquely modern, feminist point of view. This show reprises some familiar images from her Les Femmes du Maroc series and mixes them with new work from her Harem series. It isn't surprising to find that at some point the "all-over calligraphy" artistic motif would eventually run its course, and Essaydi has now moved on to exploring the adjacent territory of the colorful decorative patterns found in the tiled areas of Moroccan palaces, particularly the hidden rooms reserved for members of the harem. Her models pose in sitting nooks, doorways, on floors and near archways, surrounded by elaborate wood carvings and staggering patterned tilework. Once again, she uses the camouflage technique of matching her models' robes to the surrounding environment, this time covering the loose drapery with endless blue and white abstract geometries. Her young women are trapped in these spaces, lost in the endless and elaborate ornamentation, dissolving into intricate designs. These new works once again consider many of the same themes from her earlier work: the role of women in the modern Arab world, the constraints of tradition, and the Islamic cliches, conventions and misunderstandings of the West. 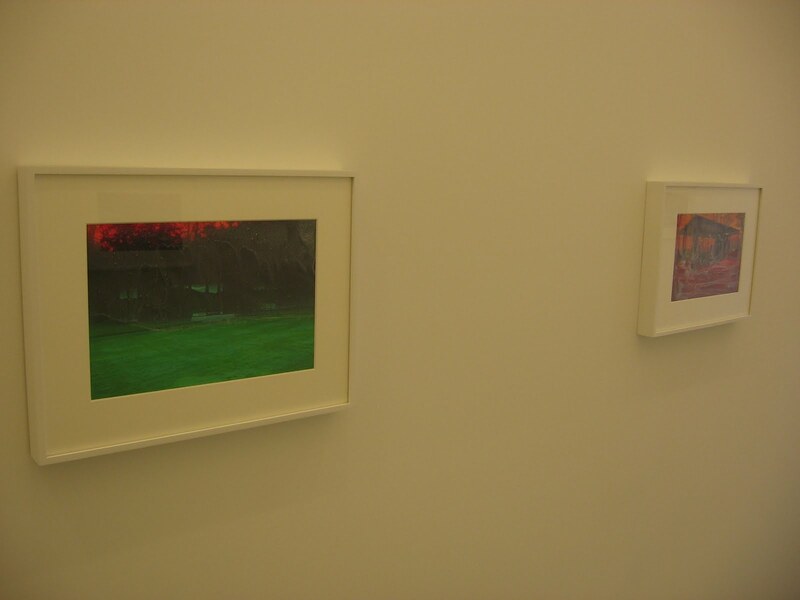 Her pictures continue to be pleasingly decorative, while at the same time quietly undermining the scenes they portray. All in, in this new series, Essaydi hasn't radically modified the artistic formula that has worked for her in the past; instead, she has made a smaller step to a related set of subject matter that can be easily placed into her existing (and already successful) visual framework. 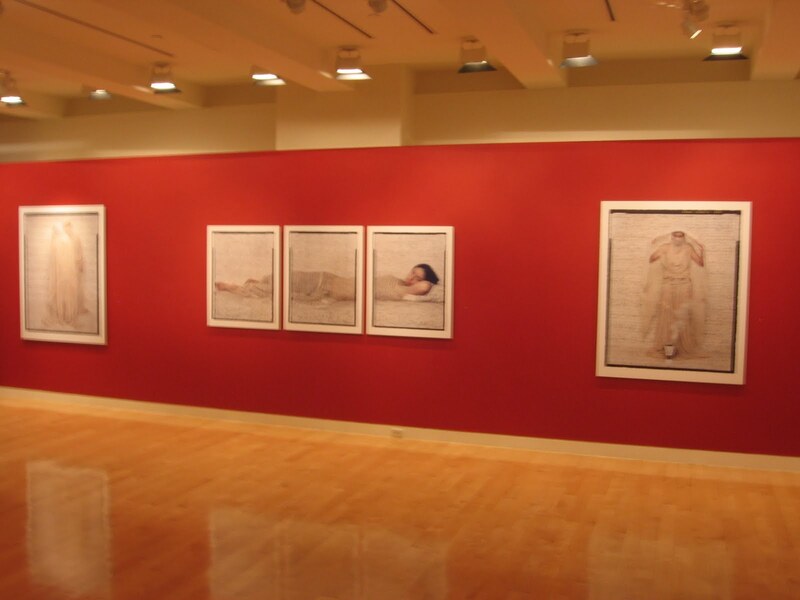 Collector's POV: The works in the show range in price from $9500 to $32000, largely based on size it appears. Essaydi's prints have entered the secondary markets with more regularity in recent years, particularly in Contemporary Art auctions. Prices for these sales have generally ranged between $7000 and $15000.